L lenses from Canon are always considered to be the epitome of their lens technology. So each time they have a L lens ready to launch, it is eagerly anticipated by the photography fraternity. For professional photographers who use a full frame body and shoot architecture, wedding or portraits, not having an ultrawide angle lens is synonymous to blasphemy. While a lot of them even carry a lightweight prime for their favorite focal length such as wedding photographers who prefer to take some time to shoot the pre-wedding photographs, but mostly a wide angle zoom lens or even a standard zoom is what most wedding photographers prefer. While every photographer has his own preference and love to carry gear that he enjoys shooting with, a Canon L series wide angle is still going to turn some head. Having said that landscape and architecture and for that matter even photojournalism also requires wide angle lenses. 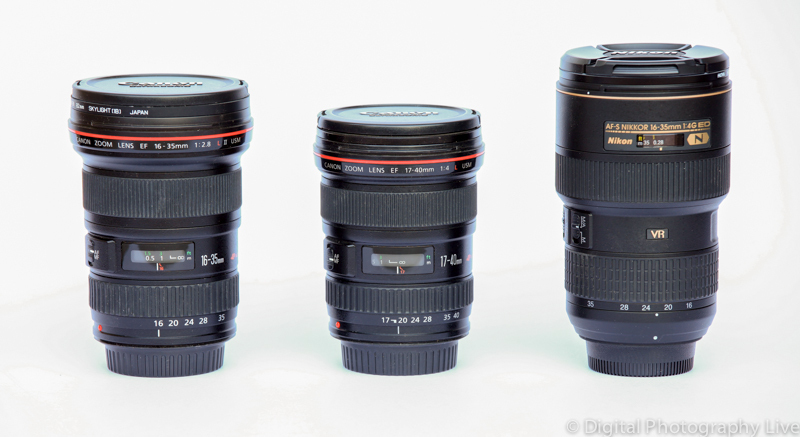 As such the Canon EF 16-35 f/2.8L II is one that should be interesting to most photographers. Version two of the very popular Canon EF 16-35 f/2.8L weighs 640gms. So it is nowhere near as light as you would expect if you are looking for a compact prime lens. However, you can carry this lens around easily in a bag along with the rest of your shooting gear. 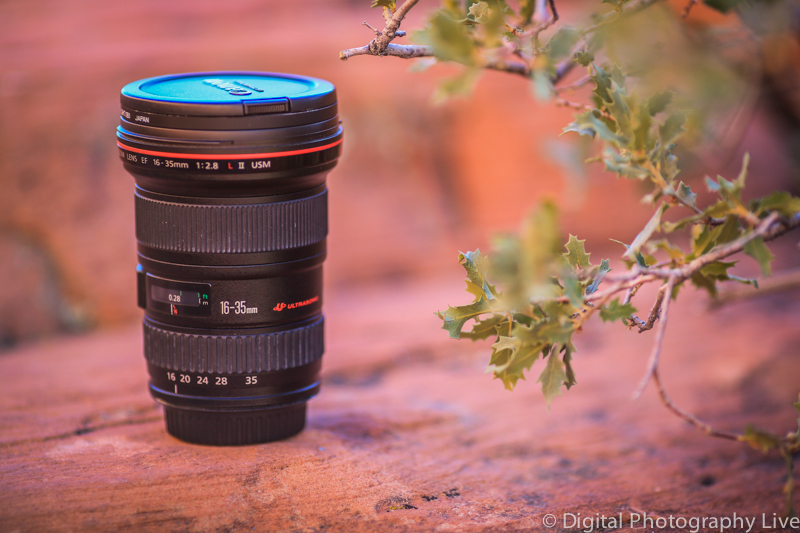 If you have a full frame Canon DSLR (with an EF mount) then this lens should be perfect for you. All L series lenses manufactured by Canon are EF mounts so they fit on all full frame, APS-H and APS-C bodies. However on APS-H cameras there is going to be a 1.3x crop factor. On APS-C bodies the crop factor would be 1.6x. Incidentally the crop factor also has a positive influence on vignetting as the cropped bodies only uses the image from the center of the lens. For those who does not own a full frame Canon body and have no intention of migrating to one at the moment then it is better not to invest in something as expensive as this one which is ultimately going to be cropped down. There are plenty of wide angle EF-S lenses which are cheaper and features the latest IS II technology for maximum stabilization. The Canon EF 16-35 f/2.8L II features ring type USM. There are two types of USM that Canon uses in its L series lenses. The Micromotor based one is the cheaper and the slower of the two. The other one is the ring type USM. This is more expensive but also faster and quieter when focusing. This lens has Full Time Manual focusing (FTM). What it does is greatly enhances the focusing speed and preciseness. When shooting at wide or at the far end of the focal length, simply allow the AF to focus in and then turn the focusing ring manually to correct the final result. Weather sealing is often a necessity rather than a luxury for photographers using their gear out in the open; and we are not referring to wild life or landscape photography only. The Canon EF 16-35 f/2.8L II is a weather sealed equipment. It is protected from water. Though to make it completely safe a screw type filter will be required at the front of the lens. Additional gear such as filters can be used with the lens. The filter diameter is 82mm, the largest of all of Canon’s lenses which makes it pretty expensive to even buy a neutral density or a polarizing filter. Internal focusing features of the lens makes it suitable for photographers who frequently use filters when shooting. This lens is tailor made for wide angle shots and for shooting architectures or flowers of portraits in bright sunlight one will need filters. However there is one piece of advice for selecting filters. In spite of the fact that Canon has used 3 high-precision aspherical lens elements in the Canon EF 16-35 f/2.8L II, there is some noticeable vignetting, specially when shooing at wider focal lengths. This vignetting can be more pronounced if an additional filter of regular thickness is used. Thinner filters would have a lesser effect on the corners of the sensors leading to reduced vignetting. We have already discussed in the previous paragraph about the problem of vignetting in this lens. However a bit of barrel distortion is also noticed specially when shooting at 16mm. For professional photographers shooting architecture, barrel distortions can pose a bit of a problem. However with converters this can be easily corrected. A bit of flare have also been noticed when shooting straight at the sun. For those who are into video shooting, especially when using a full frame body like the EOS 5D Mark III, this lens is going to be a joy. The roughly 65˚ of focusing turn means you are going to get a precise manual focusing when shooting videos with this lens. The wide aspect of the lens also allows for less camera shake and more dramatic cine-type effects. Shooting portraits at f/2.8 you can get very good bokeh that you normally come to expect from an ultra wide angle lens. Wedding photographers generally prefer to shoot at varying focal lengths but ultra wide angle is one aspect that they do use for some candid shots. Whenever we talk of wedding photography, bokeh is one aspect that immediately comes to our mind. Pre-wedding shoots of the bride and the groom is one such moment where the EF 16-35 f/2.8L II can really come handy. Even during the course of wedding one can use bokeh to good effect. For that the f/2.8 and ring type USM is going to be splendidly effective. Low light performance is better when compared to something like the Canon EF 17-40mm f/4 L USM, with this one having nearly twice as much as light gathering capabilities. Wedding photographers would love to use this lens as their first choice together with something like the Canon EF 24-70mm f/2.8 L II USM. For landscape and especially for architecture photography, this lens is really suitable with its impressive performance in bright light, reduced chromatic aberrations and minimal vignetting and barrel distortion. Although all of them are present along with a bit of lens flare, full frame users are not going to find these too bad to be a deal breaker. Stopping down from f/2.8 to something like f/4, the problem of vignetting and barrel distortion can be greatly corrected. Anyways, for landscape and architecture photography one would be stopping down to something like f/22 or even smaller aperture to put everything in focus. Amstelveen, The Netherlands, 22 February, 2007: Canon today releases its latest L-series EF lens along with several accessories optimised for its new professional SLR, the EOS-1D Mark III. The EF 16-35mm f/2.8L II USM is set to become the ultra wide-angle zoom of choice for professionals. With vastly improved peripheral sharpness, it replaces the popular EF 16-35mm f/2.8L II USM as Canon’s leading wide-angle zoom. A constant f/2.8 aperture ensures exceptional low light performance and depth-of-field control throughout the zoom range. Canon’s engineers have completely redesigned the optics on the EF 16 35mm f/2.8L II USM to deliver higher contrast levels and improved resolving power. To ensure corner-to-corner sharpness and contrast throughout the focal range, the lens includes three types of aspherical lens elements (ground, replicated and glass moulded). Two UD lens elements virtually eliminate chromatic aberration, while Super Spectra lens coatings suppress flare and ghosting. Rapid auto focus is driven by a virtually silent Ring-type Ultrasonic Motor (USM) incorporating Canon’s latest auto focus algorithms. Full-time mechanical manual focus override is also provided. As with all L-series lenses, the EF 16 35mm f/2.8L II USM is weather sealed to protect against dust and moisture. A new 82mm Protect filter for the EF 16 35mm f/2.8L II USM has been released to coincide with today’s launch.